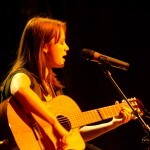 Ebba Holst held a consert at SSHL where the students performed and their parents bought snacks. A total of 7000 SEK (about 700 Euro) was collected and sent to Nepal. You can read about the consert in Sigtunabygden here and on Facebook here.